Last Saturday was cool and cloudy. I was thinking of climbing Collins Bonnet, but really set off from home a little late. I hadn't ever climbed Collins Cap before, so this looked like an enjoyable alternative. I'd probably have had time to get back from Collins Bonnet anyway, but it was getting dim in the forest when I returned down the hill. This walk is about an hour shorter than the Collins Bonnet Walk. Drive to Myrtle Forest near Collinsvale, and park in the carpark. The walk starts along a roadway which becomes a walking track beyond a picnic shelter. 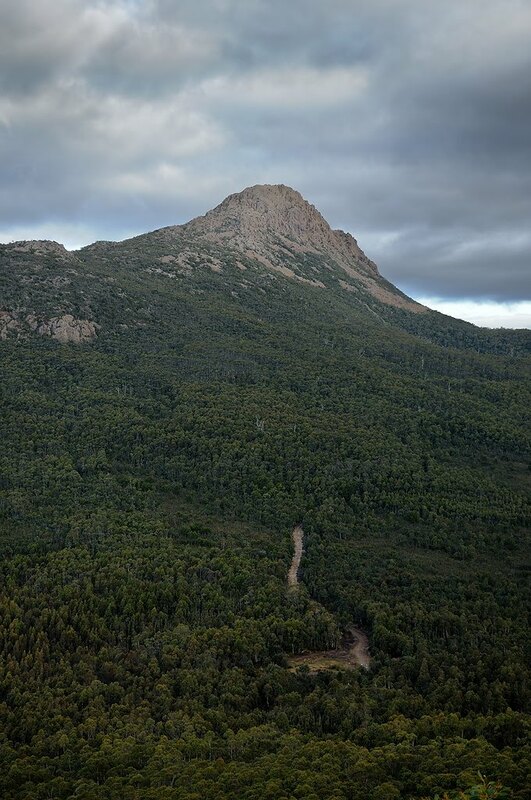 The track climbs steadily and steeply until a marked intersection is reached around 30-40 minutes from the start of the walk. The right hand track heads west, steeply uphill towards Collins Cap. It crosses a 4WD track, and then emerges very soon on another one. The Collins Cap track is marked across the second 4WD track. This heads up the flank of Collins Cap. Sections are steep, and some parts are quite rough. The track is easy to follow, despite the warning sign at the second 4WD track suggesting otherwise. At the summit, a short steep climb onto the pinnacle completes the ascent. 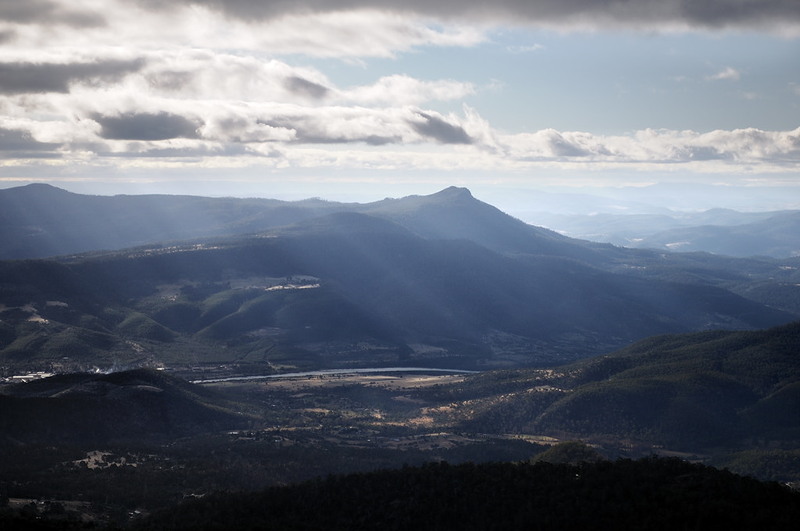 There are good views of Collins Bonnet, Trestle Mountain and Mount Marian, as well as more distant views to New Norfolk, Mount Dromedary and the Derwent Valley. Last Saturday there was a lazy cold breeze, and views were curtailed a little by cloud and distant rain. A nice big mug of hot soup provided by the Pocket Rocket at the summit was just the ticket. The normal return is a retrace. 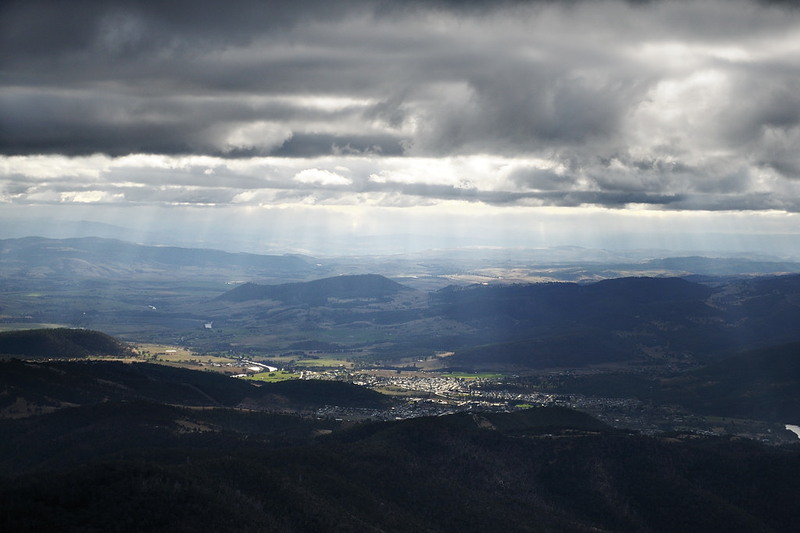 However from the lower 4WD track, Collins Bonnet or the other more westerly peaks in the Wellington Range can be accessed. With a longer day available, climbing both Collins Cap and Collins Bonnet would make a good day. Leeches live in the forest, and this is a place where I have acquired them more reliably than elsewhere in the past. None on this occasion.